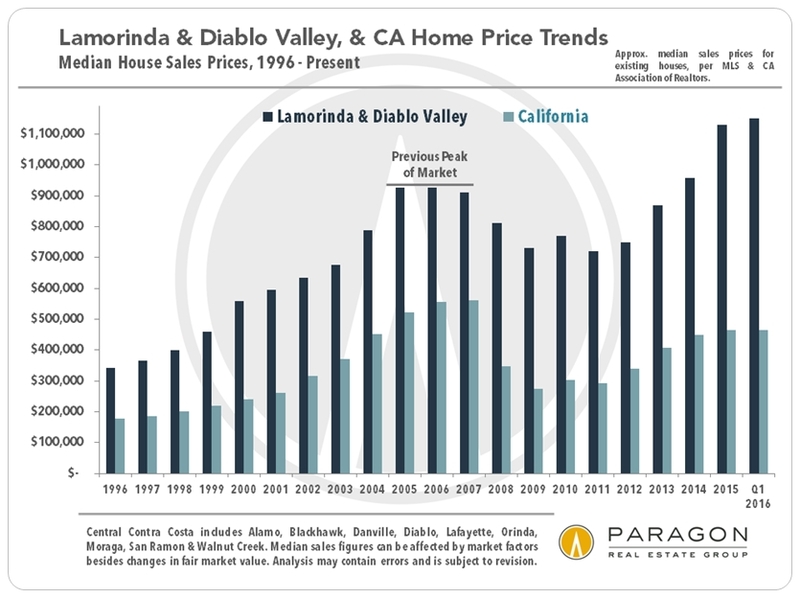 A look at recent market values, trends and dynamics in Diablo Valley “Lamorinda” in Central Contra Costa County, and along the Hwy 580 Corridor of southern Alameda County. occurred for more and half for less. 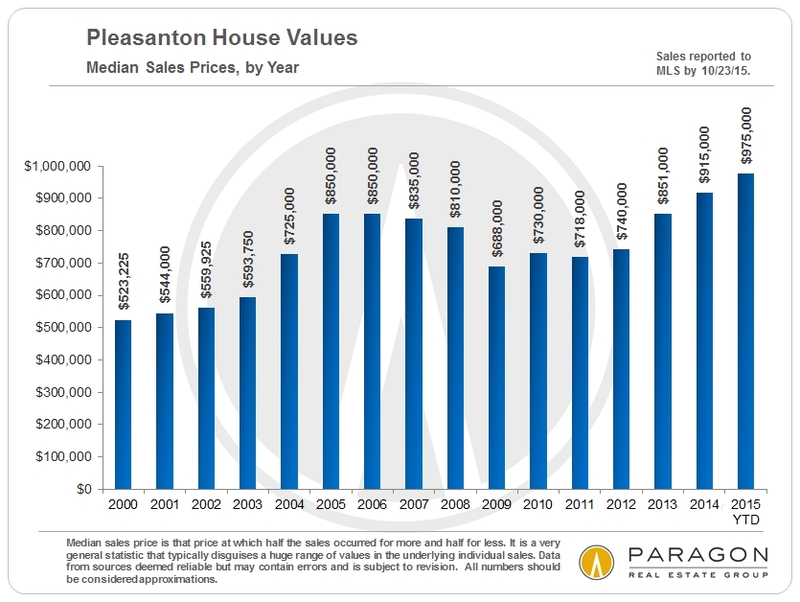 For the Central Contra Costa Median House calculation, we used the estimated 1994 median sales price ($335,000), with a 20% downpayment ($67,000) and paying 1.5% in buy-side closing costs ($5025) for a total cash investment of $72,025. 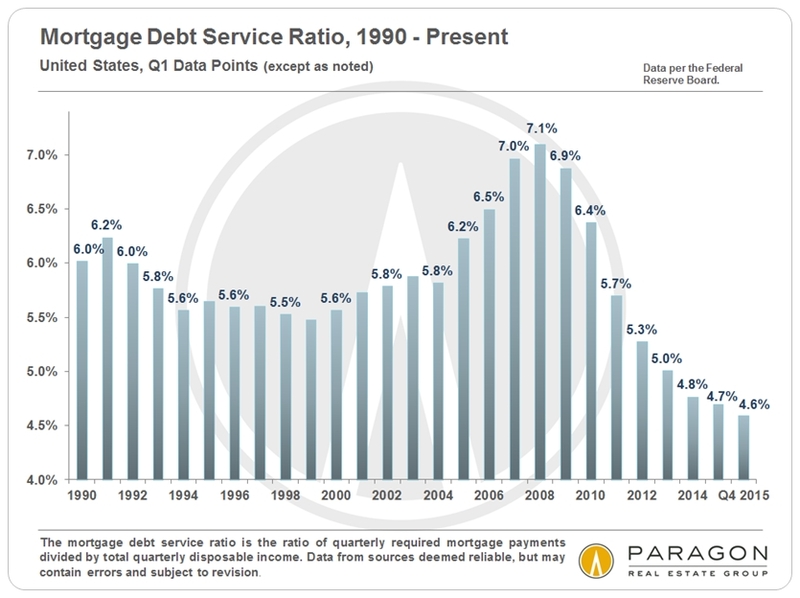 Net proceeds were calculated using the 2015 YTD median sales price ($1,055,000 as of September 2015), deducting 6% in sell-side closing costs ($63,300) and the original 80% mortgage balance ($268,000), which equals $723,700. 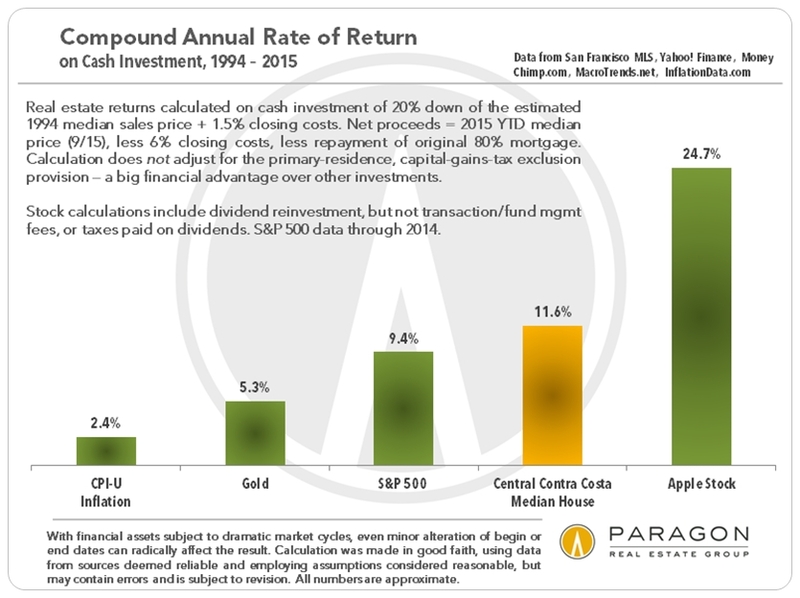 This equals an approximate annual compound return on cash investment of 11.6% over the 21-year period, which reflects a huge premium over the inflation rate. 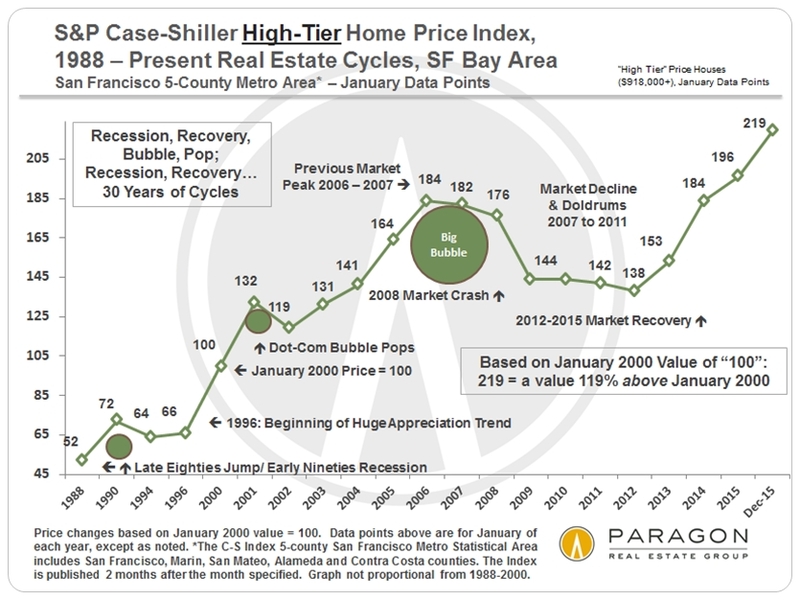 All of us should have put every penny we had into Apple stock in 1994, but barring that, purchasing a home in Central Contra Costa would have been an excellent alternative. Three factors not included in the above analysis further increase the financial benefits of home purchase over the other investments graphed: 1) the $250,000/$500,000 capital gains tax exclusion on the sale of a primary residence (potentially saving up to $75,000 in taxes), 2) the “forced savings” effect of gradually paying off one’s mortgage (if one resists refinancing out growing home equity), which has a substantial wealth-building effect, and 3) over time, the ongoing cost of housing with a fixed rate loan, strategically refinanced when rates go significantly lower, will usually fall well below rental costs that continue to rise with inflation. Please note that with financial assets subject to market cycles, such as real estate, stocks or gold, changing the buy or sell dates in this analysis can dramatically affect the return. 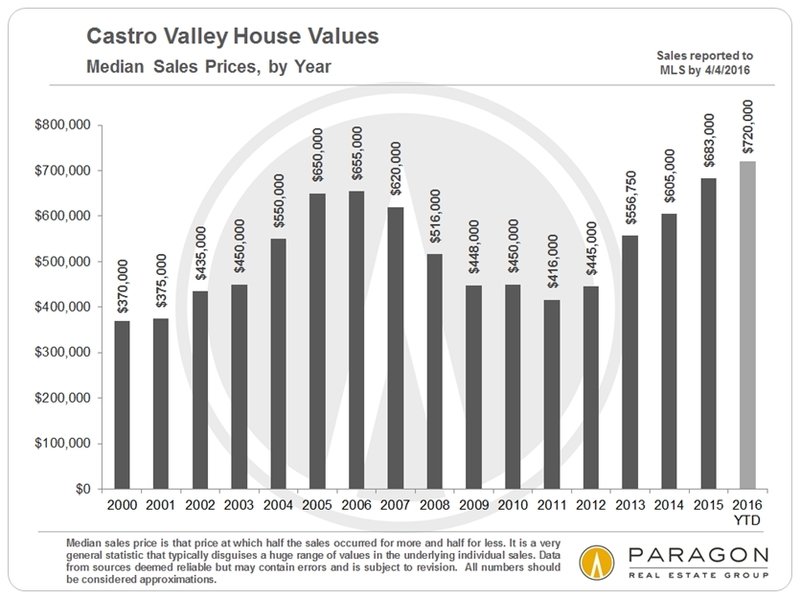 In 2014, the Central Contra Costa region re-attained the previous peak values reached in 2006. 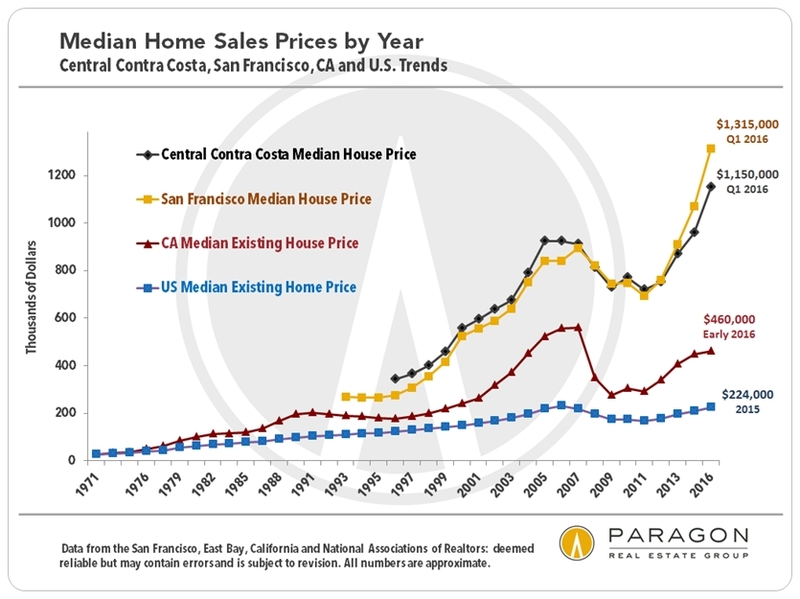 In 2015, median home prices surged well past that point to new highs. 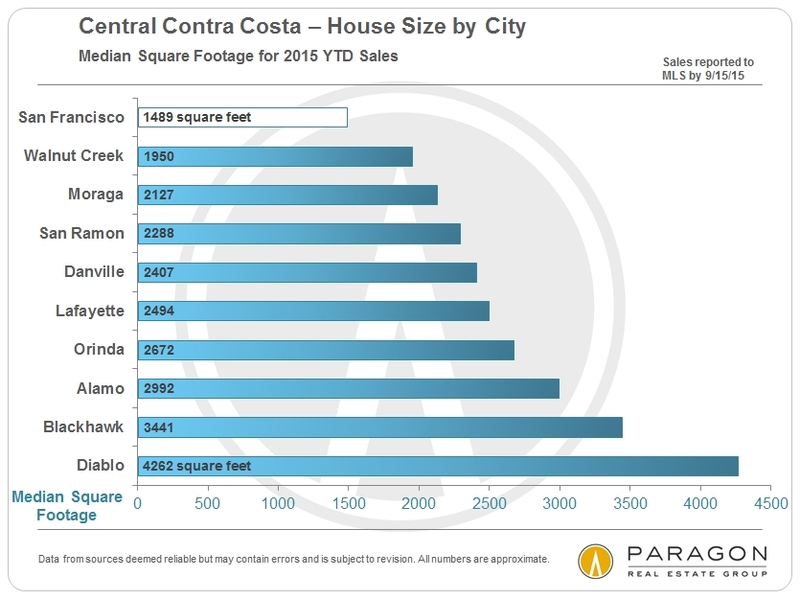 Central Contra Costa has strongly outperformed state and national real estate markets, but lags somewhat behind that of San Francisco, which, as an epicenter of the high-tech boom, has been experiencing especially feverish market conditions. 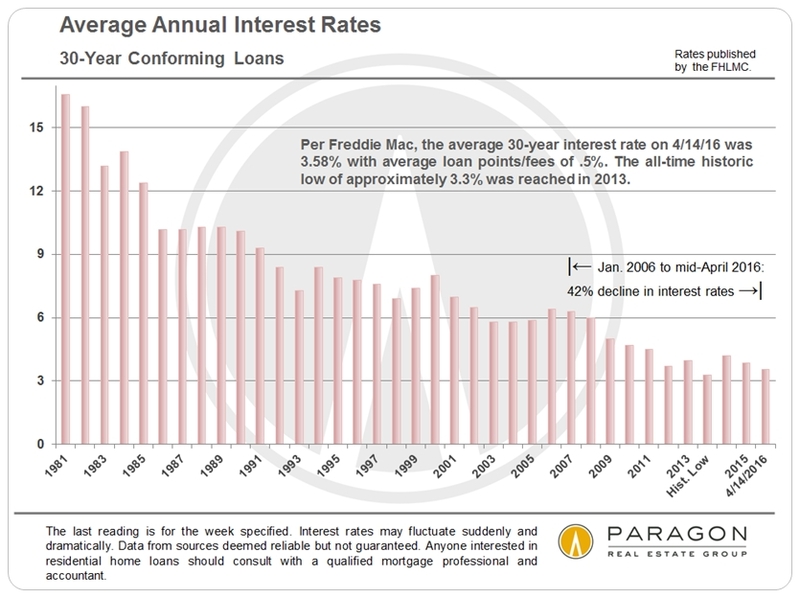 Extremely low interest rates have played an enormous role in the market recovery since 2012. 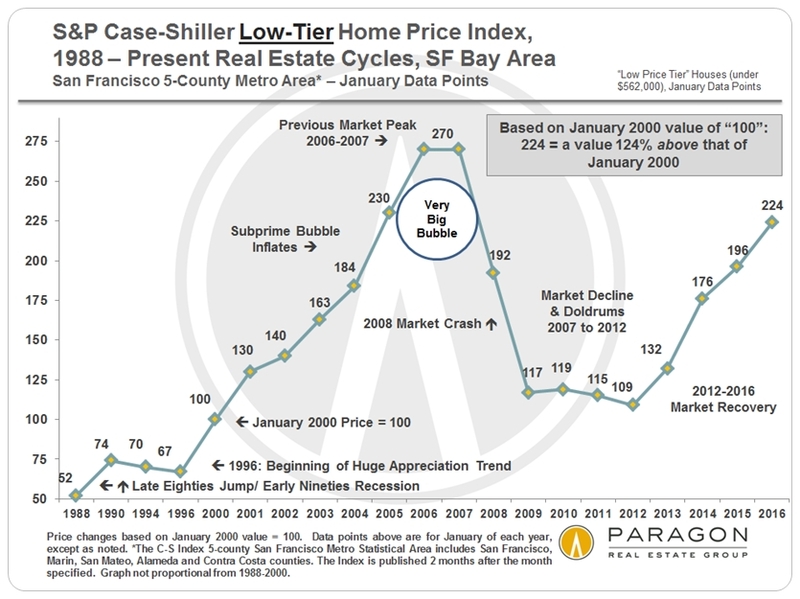 Even though home prices in most Central Contra Costa cities have now re-attained or exceeded previous peak values reached in 2006, the ongoing monthly cost of homeownership is significantly lower now because of the large drop in interest rates since that time. 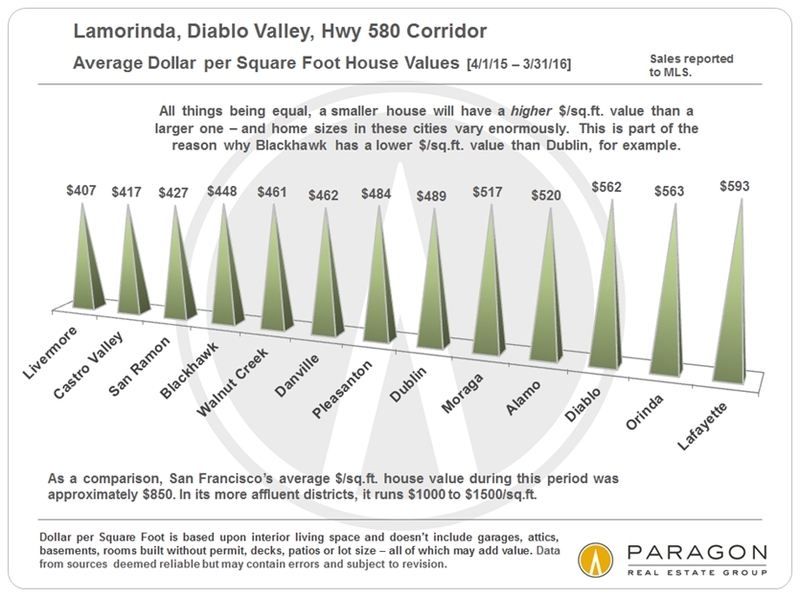 The sizes of the real estate markets in the Central Contra Costa region vary enormously: San Ramon, Walnut Creek and Danville are by far the largest markets, while Blackhawk and especially Diablo, are by far the smallest. 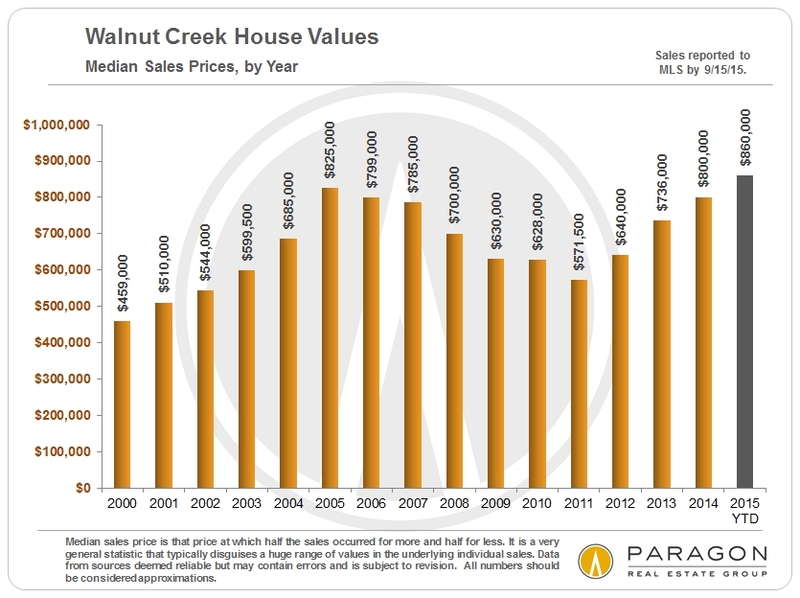 Only San Ramon and Walnut Creek have significant condo markets at this time. 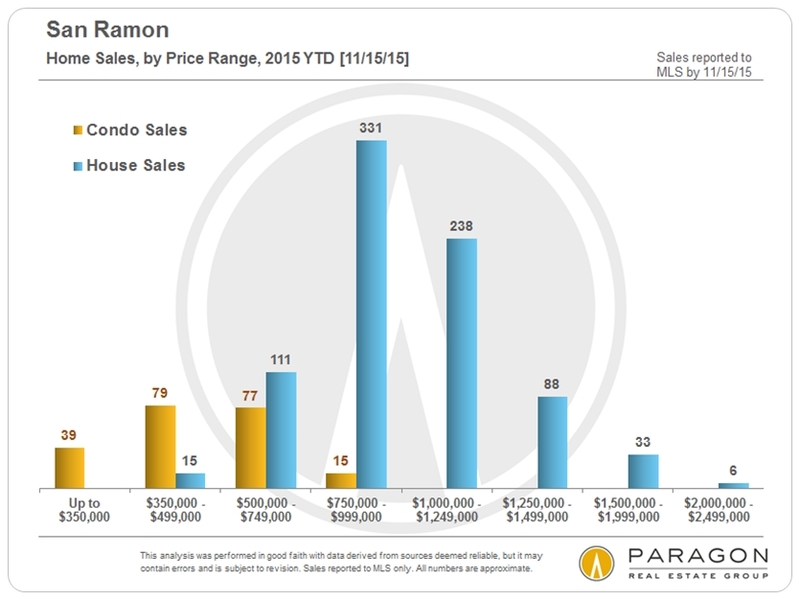 As a point of comparison, in San Francisco, condo sales now outnumber house sales. 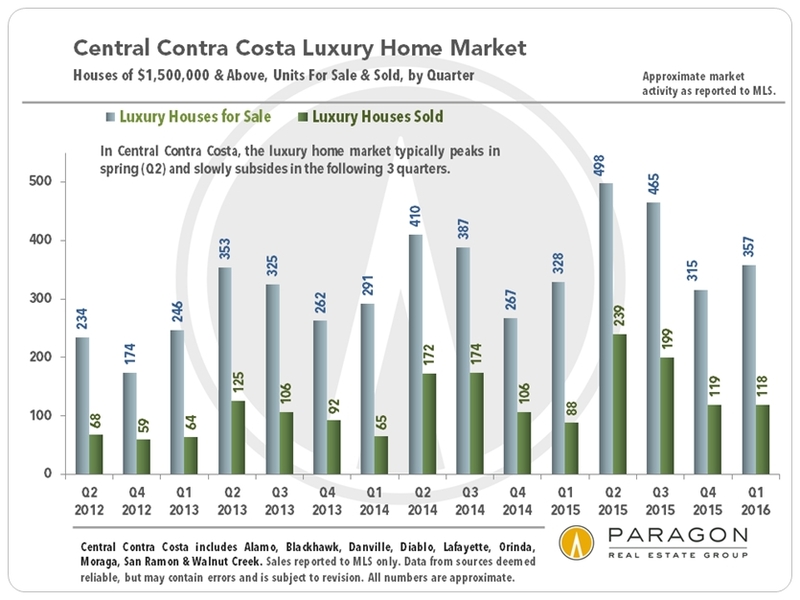 Sales of homes of $1,500,000 and above constitute about 5% of the overall Contra Costa County market and approximately 15% of the Central Costa Costa market, and for the purposes of this report shall be classified as luxury homes. 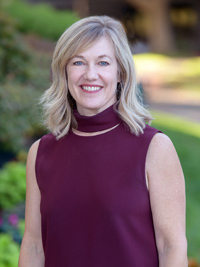 In the central county region, the number of luxury home listings has more than doubled and the number of luxury home sales has tripled on a quarterly basis since 2012. 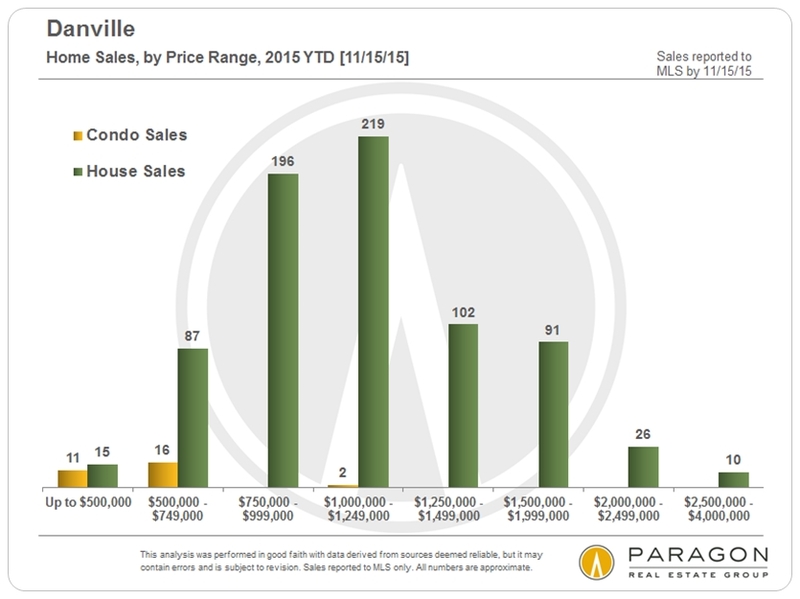 The second quarter of 2015 saw particularly large spikes in both high-priced homes for sale and sold. 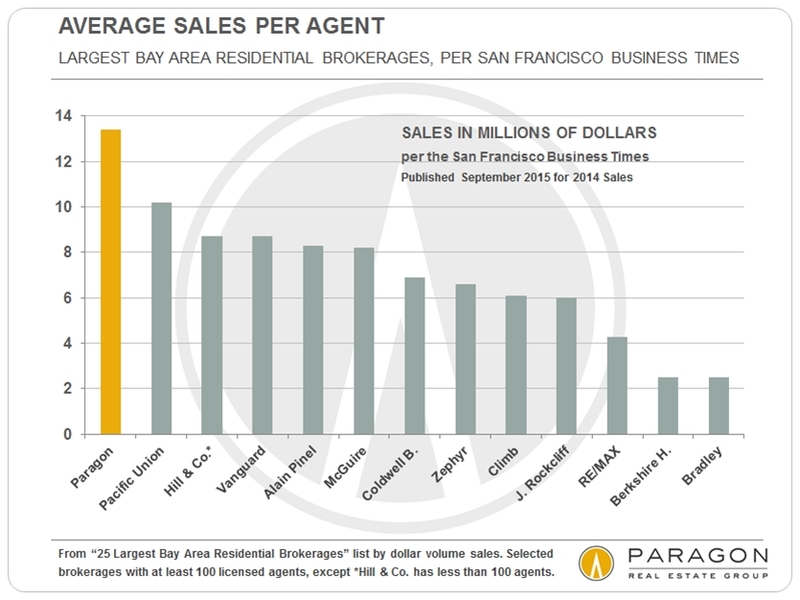 Other high-end communities and neighborhoods of the Bay Area saw similar spikes in activity. 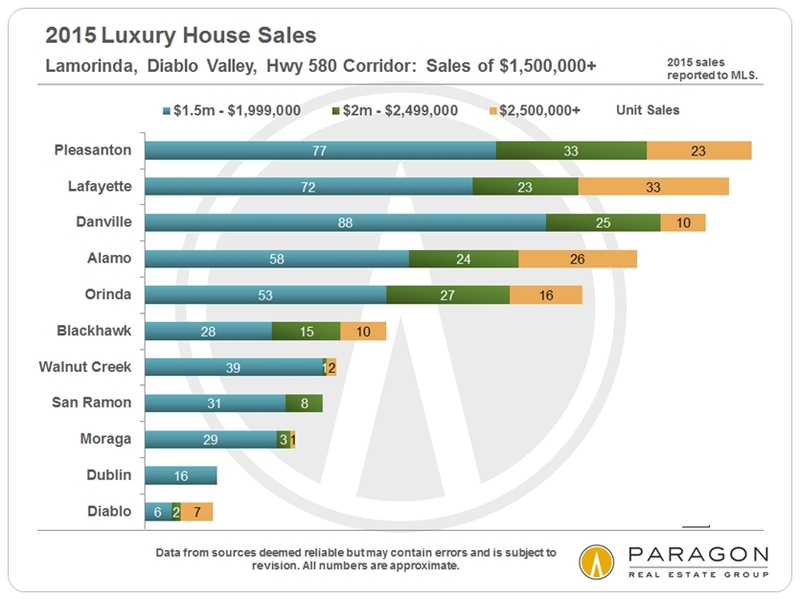 Most of these Central Costa County cities have significant luxury home market segments. 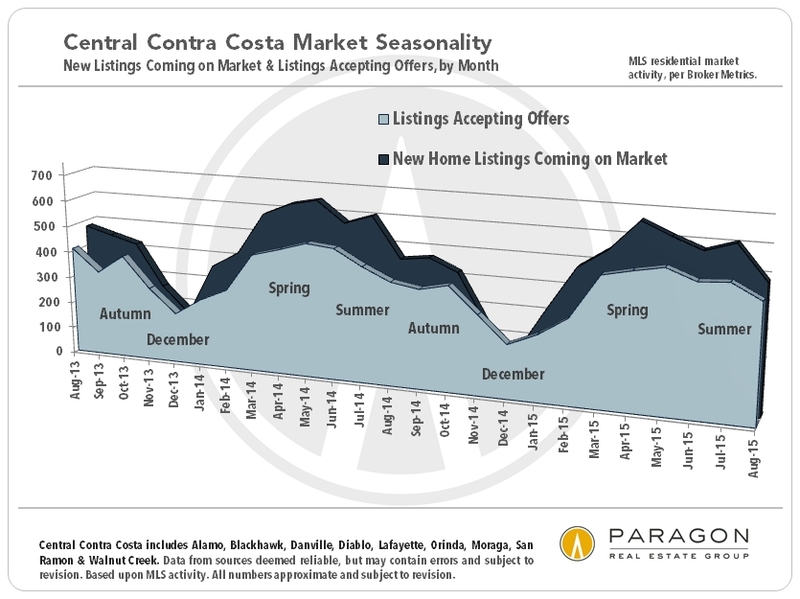 The chart above clearly illustrates the seasonal nature of the real estate market with new listings surging in spring (especially) and autumn, with the resultant increase in accepted offer activity; then dropping in mid-summer and then most dramatically during the mid-winter holiday months. 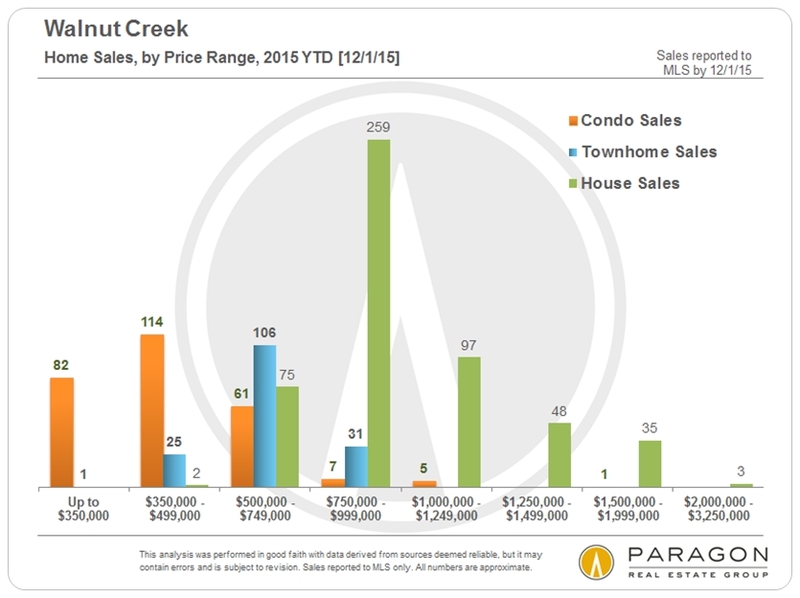 The great majority of home sales in the second quarter occurred without any previous reduction in list price – these homes sold very quickly and, on average, for over asking price. 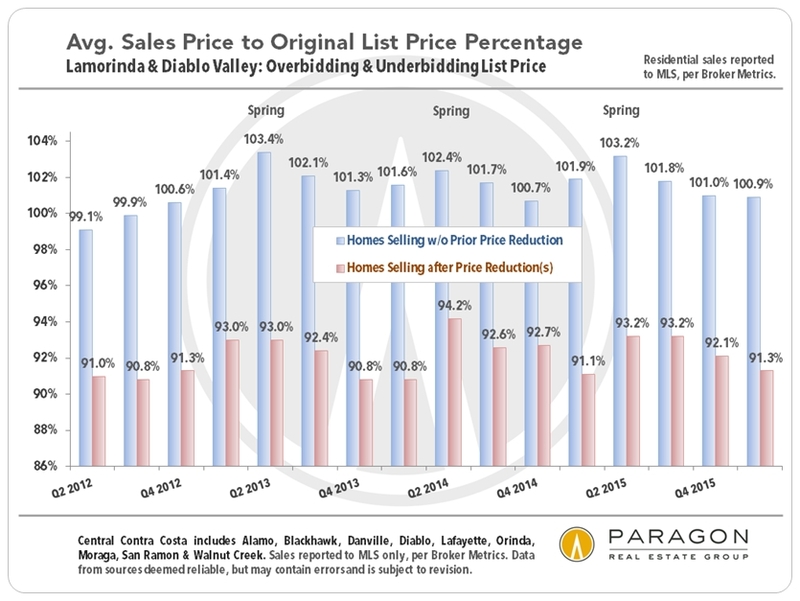 Those homes that went through price reductions prior to sale took much longer to sell and sold at a significant discount to original list price (further illustrated in the following 2 charts). And, even in a very hot market, some homes did not sell at all and were withdrawn from the market, typically due to being perceived as overpriced. 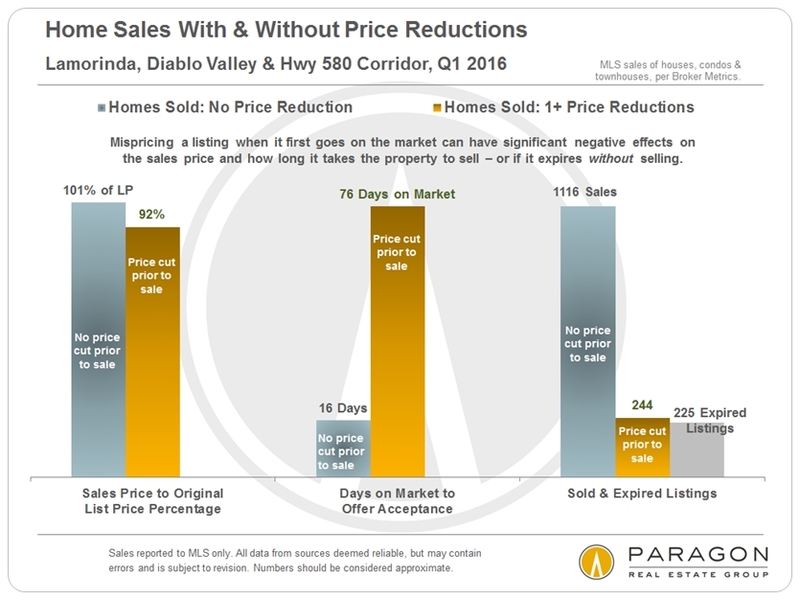 As seen above, over-pricing consistently has significant, negative effects on both time on market and sales price to list price percentages obtained upon sale. 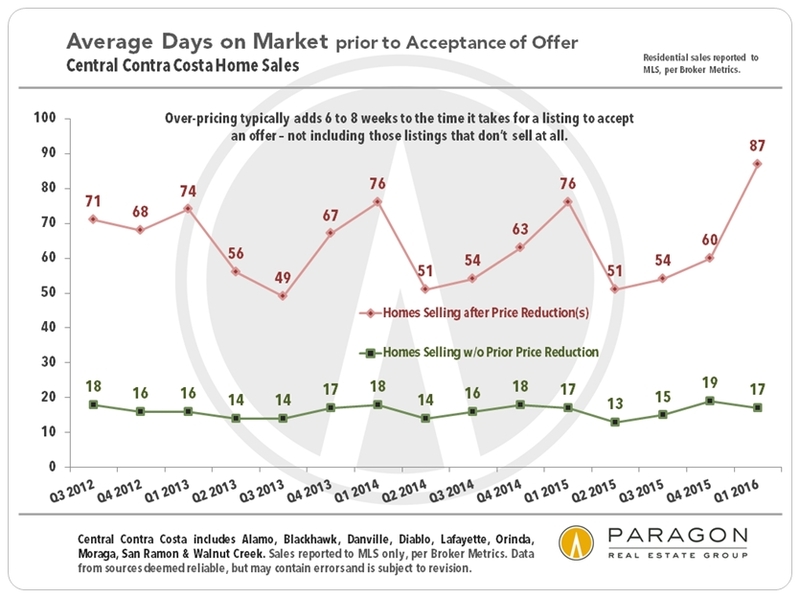 For the last few years, spring has been the hottest and most competitive selling period, and that is reflected in the average number of days on market prior to acceptance of offer. 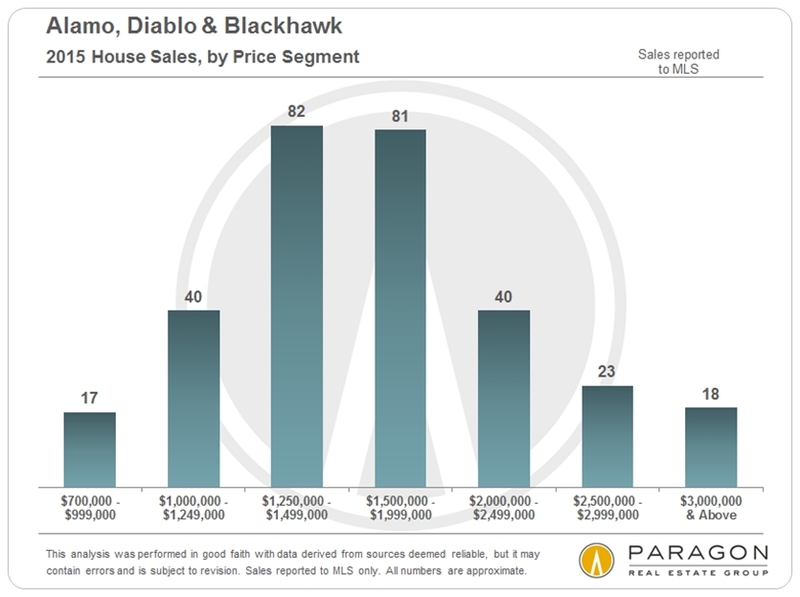 Generally speaking, higher priced homes take longer to sell than lower priced homes, and the luxury home segment is even more dramatically impacted by seasonality than lower priced homes. 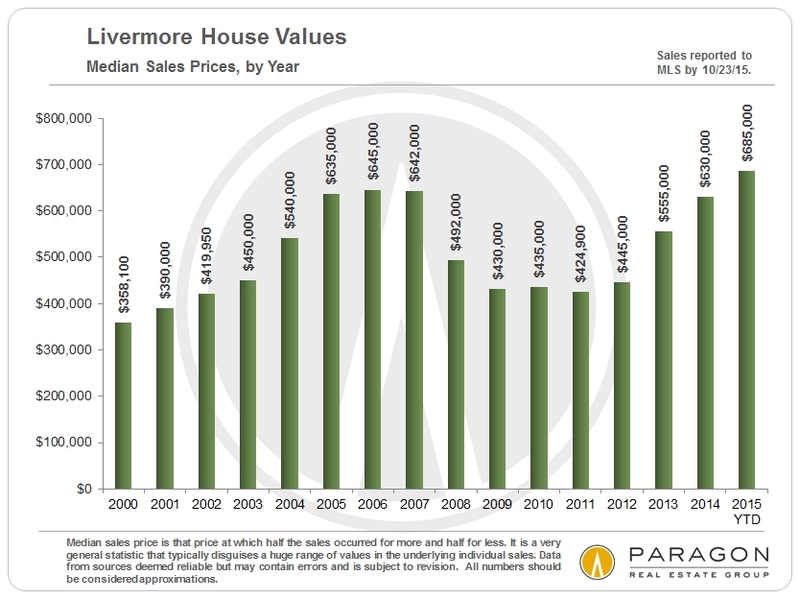 Typically, a reading below 3 months of inventory is considered to indicate a seller’s market. 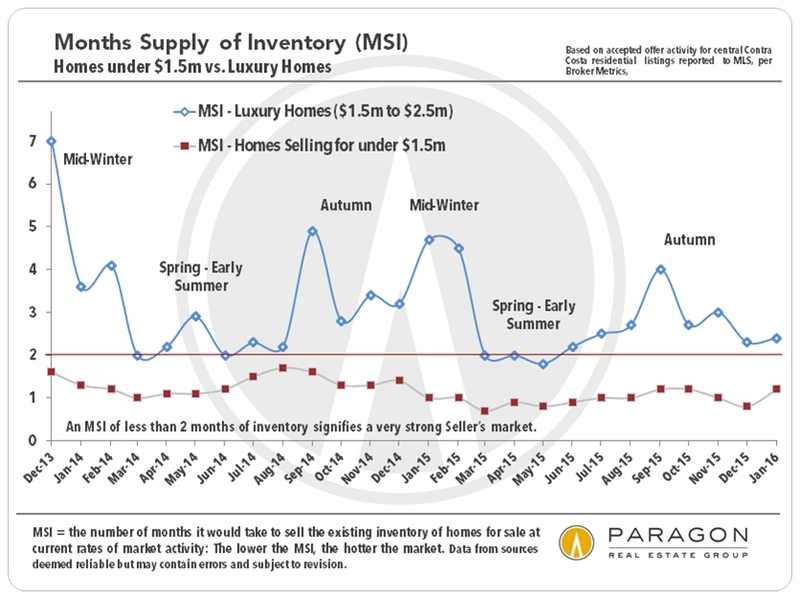 Below 2 months of inventory indicates an extremely strong seller’s market, and homes selling for under $1,500,000 have been deep in such territory for the last few years – MSI has sometimes dipped below 1 month of inventory, which is almost unheard of. 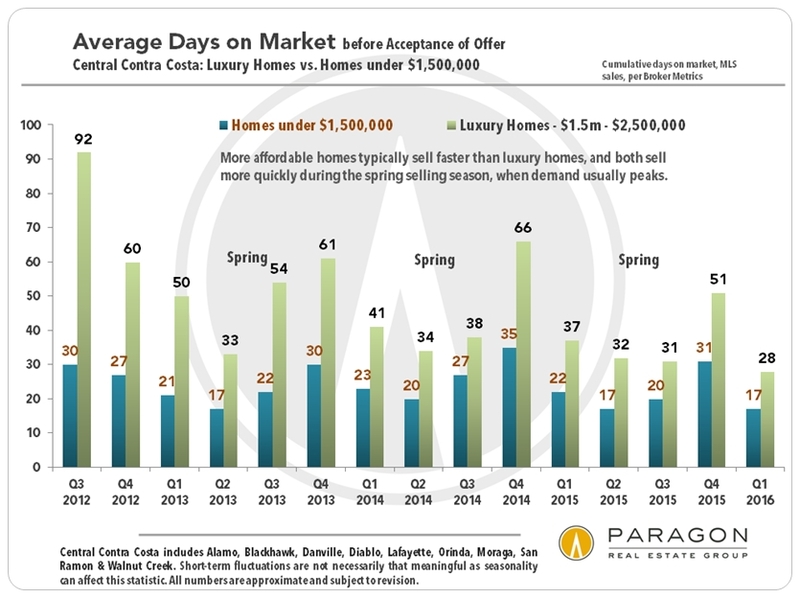 Again, the luxury home segment is more dramatically impacted by seasonality – with MSI dipping low or very low in spring and autumn, but then increasing significantly in late summer and mid-winter. This statistic compares buyer demand to the supply of homes available to purchase: The higher the percentage, the hotter the market. 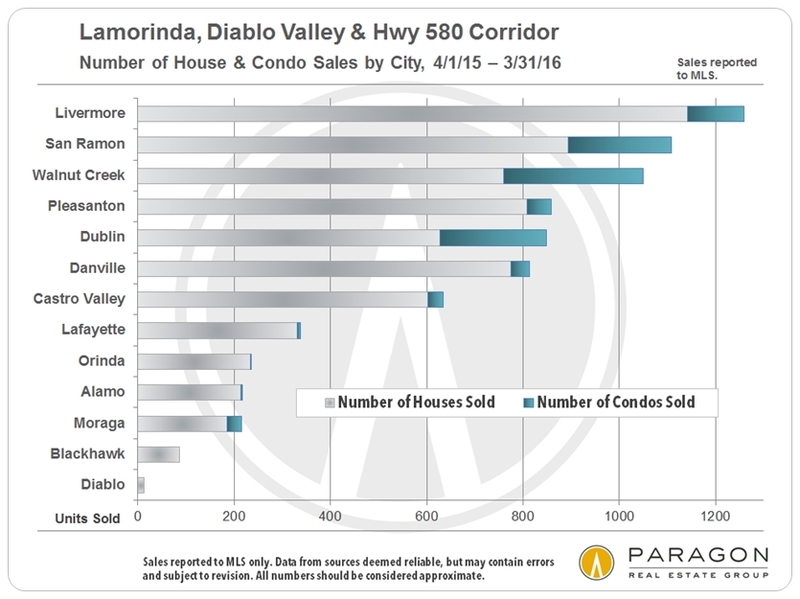 In Central Contra Costa, the more affordable segment has seen the greatest amount of demand and the highest level of competition between buyers. 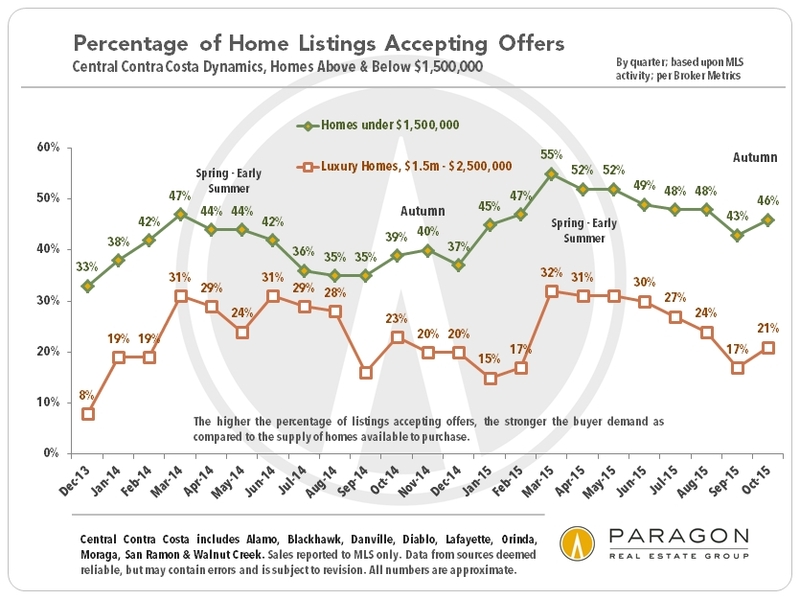 Typically, the more expensive the home, the smaller the pool of potential buyers. The California Association of Realtors Housing Affordability Index (HAI) measures what percentage of households in a given area can afford to buy a median priced home at a given time. It uses household income, interest rates and home prices in the calculation. 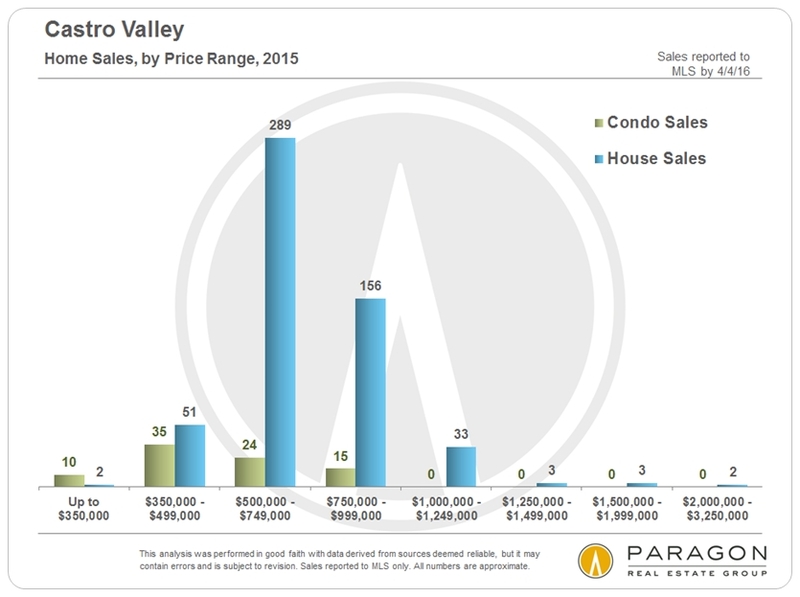 In Q2 2015, affordability dropped in every Bay Area county, and is getting particularly low in San Francisco. 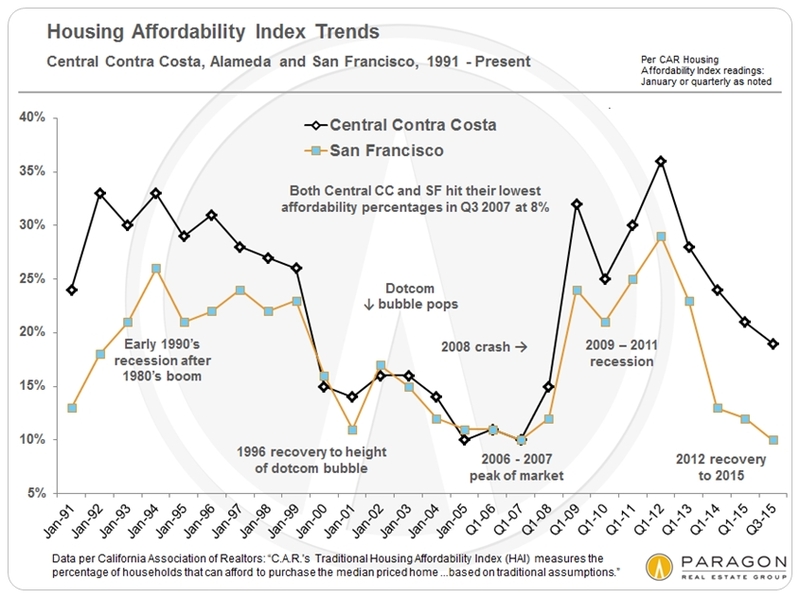 Central Contra Costa’s affordability percentage is dropping, but still above the percentages prevalent during the period of 2000 to 2007 – and very low interest rates are certainly a large factor. 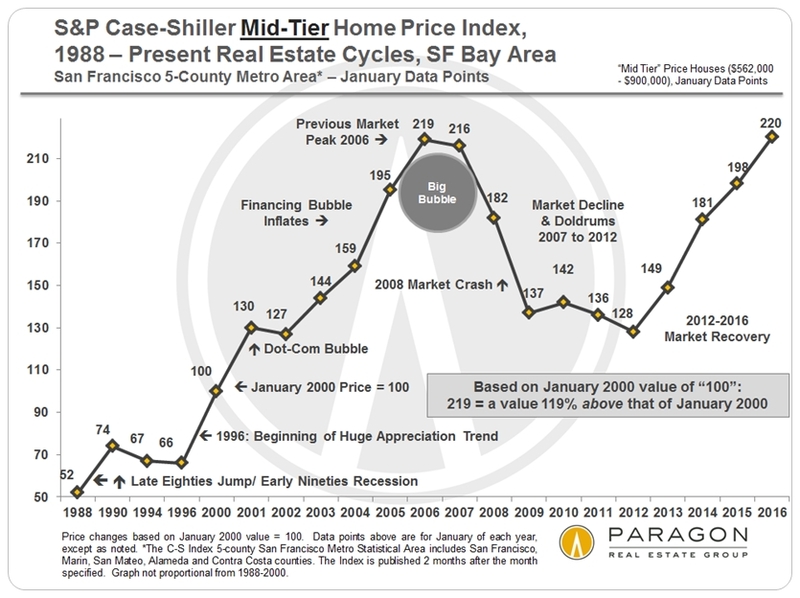 The lowest HAI reading for both SF and Central Contra Costa was in Q3 of 2007, when it hit 8% (not shown on chart). 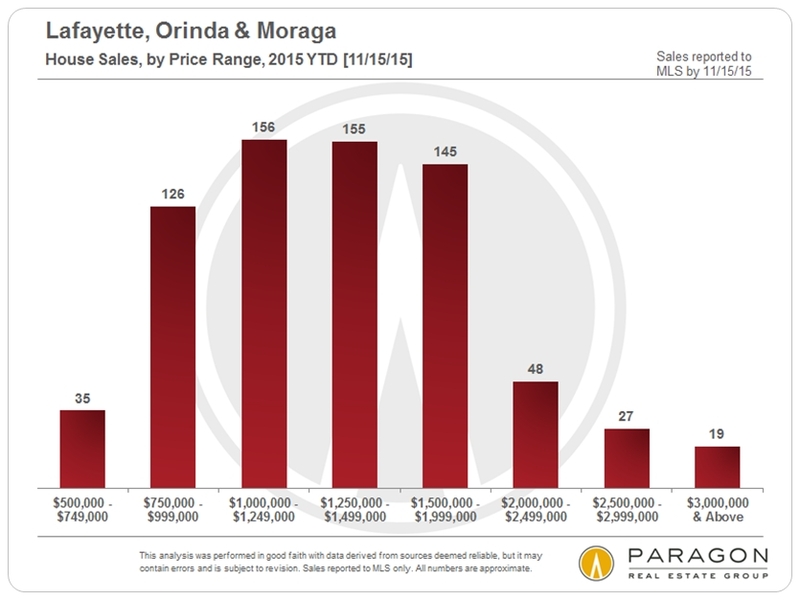 Homes in the more affluent communities of Central Contra Costa generally fit into the mid-price and high-price tiers(though many of the other communities of the county have low-price-tier real estate markets). 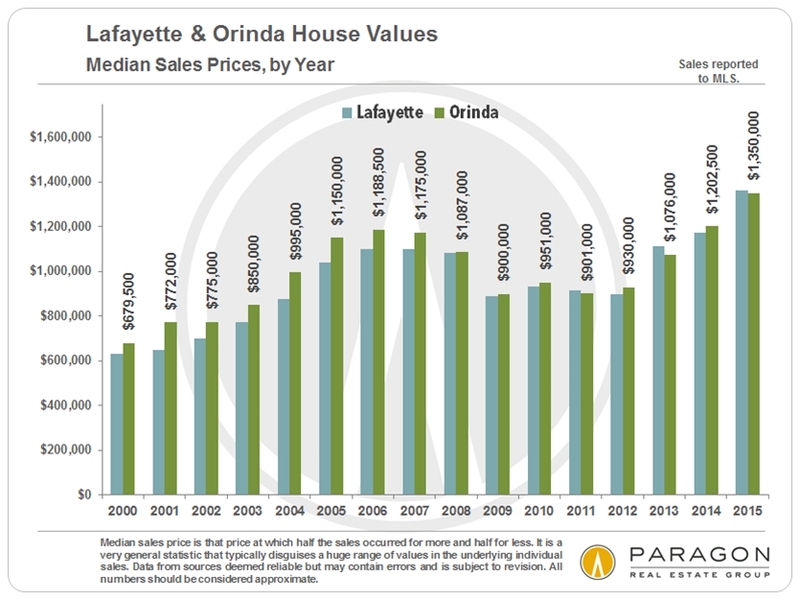 There are charts tracking median home price trends by city further down in this report. 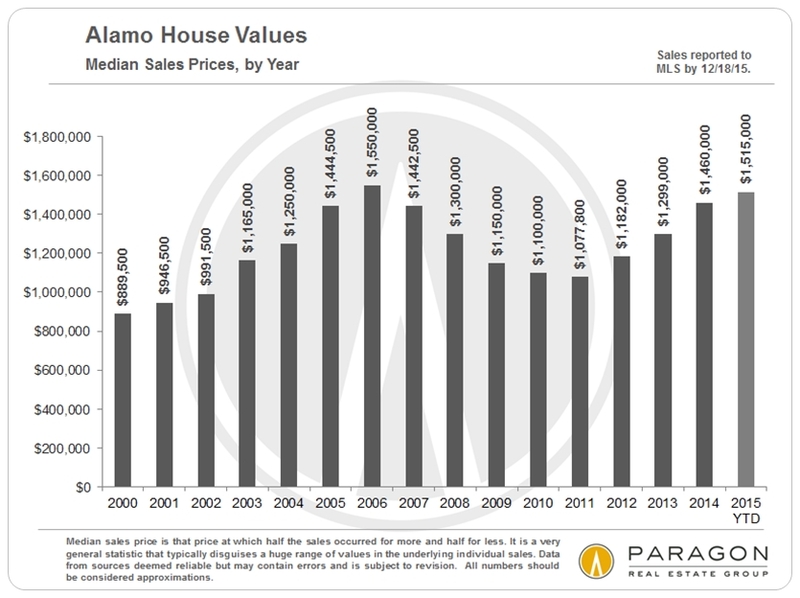 In the charts below, the index readings refer to a January 2000 home value of 100. Thus, a reading of 218 indicates home values 118% above that time. 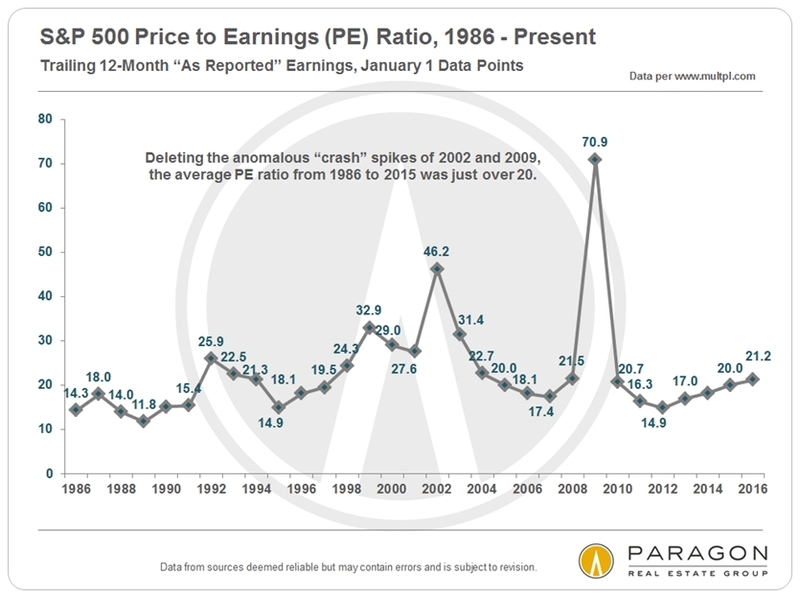 It’s interesting to note that even with their drastically different bubbles and crashes, all 3 price tiers now show a appreciation rate of 118% to 119% % since January 2000.
than low-price tier. Strong recovery has returned it to its 2006 peak. 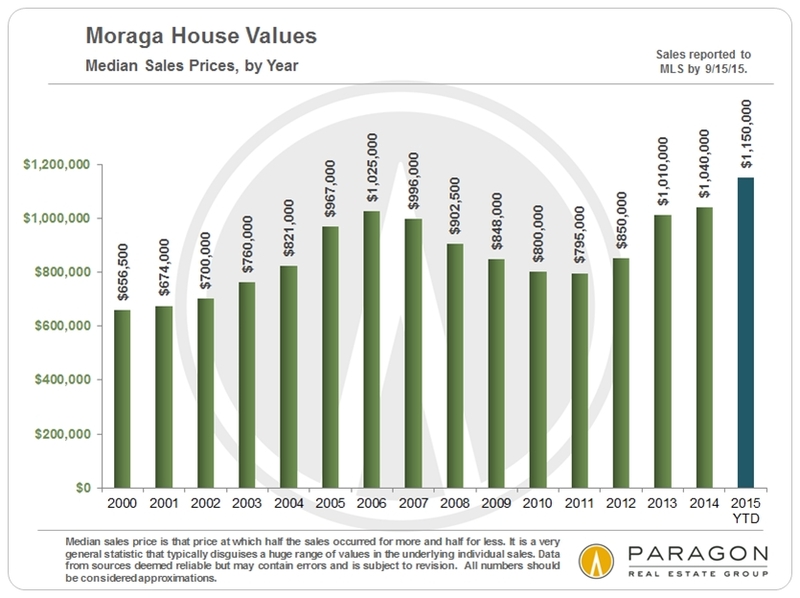 Median sales price is that price at which half the sales occurred for more and half for less. It is a very general statistic, which typically disguises a huge range of prices in the underlying individual sales. 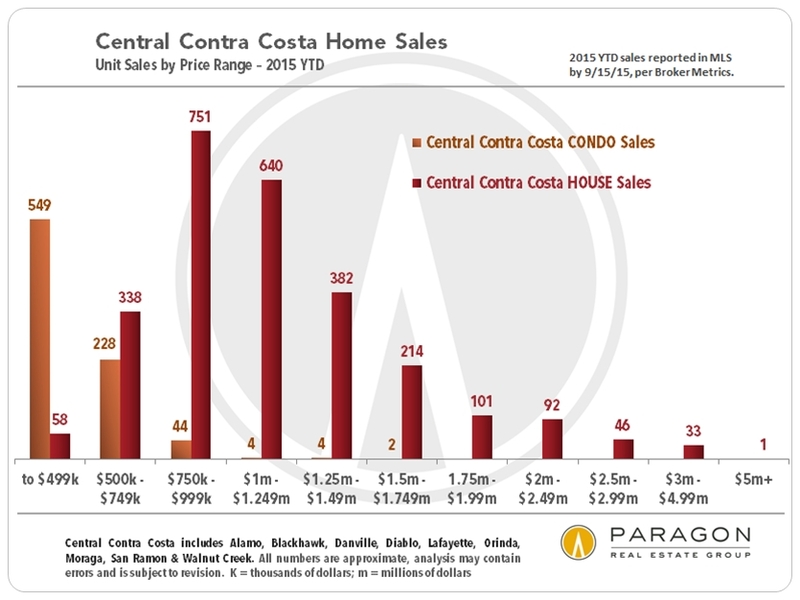 It can be affected by other factors besides changes to fair market value, such as inventory available to purchase, interest rates, and significant changes in the luxury, new-construction or distressed-home market segments. 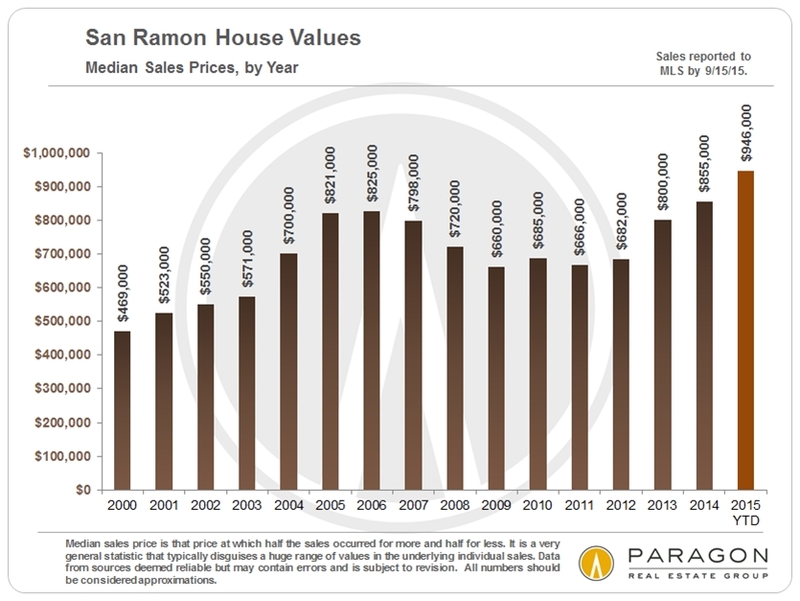 Homes in different communities often cannot be compared on an apples-to-apples basis, but median sales prices do give an indication of comparative home values and longer term trends in home prices. 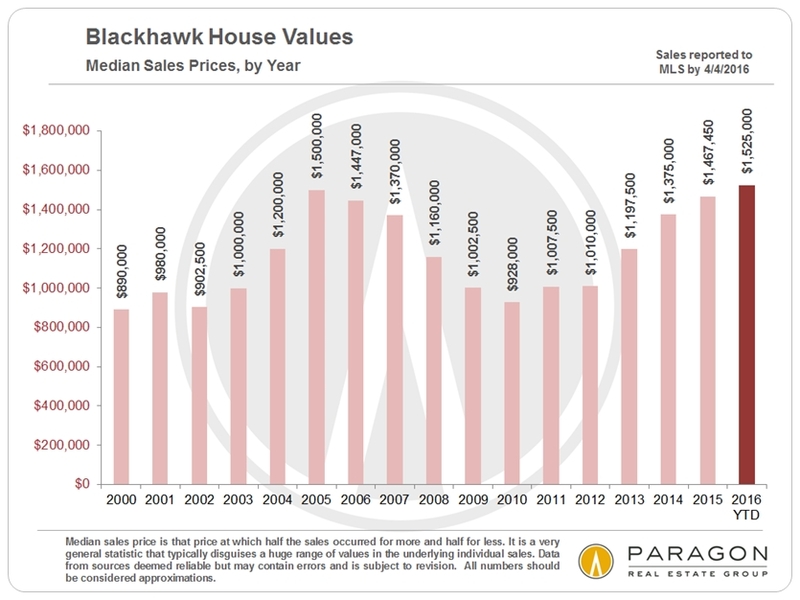 How a city’s median sales price applies to a particular property is unknown with a specific comparative market analysis. 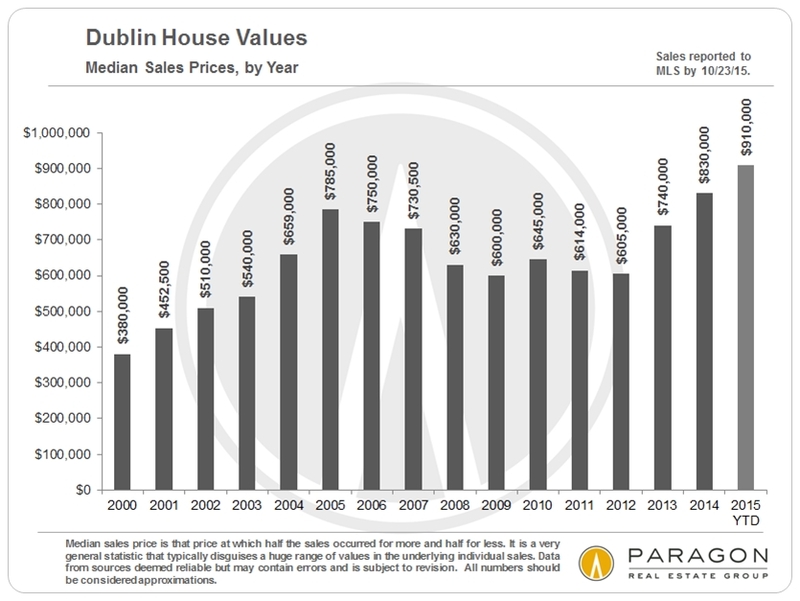 Note that median sales prices will usually change if the period being measured is changed even slightly. 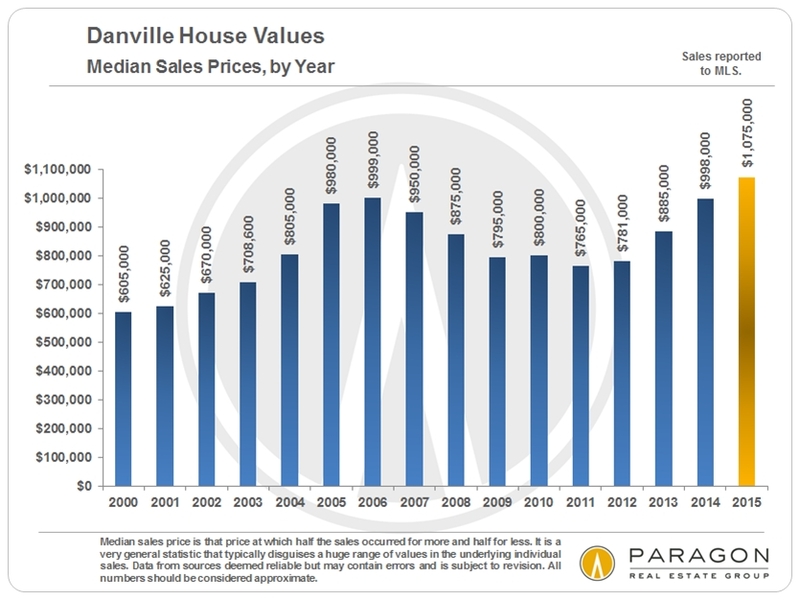 Especially if the number of sales is relatively small, prices can sometimes fluctuate dramatically, simply depending on the specific homes that sold within the period. 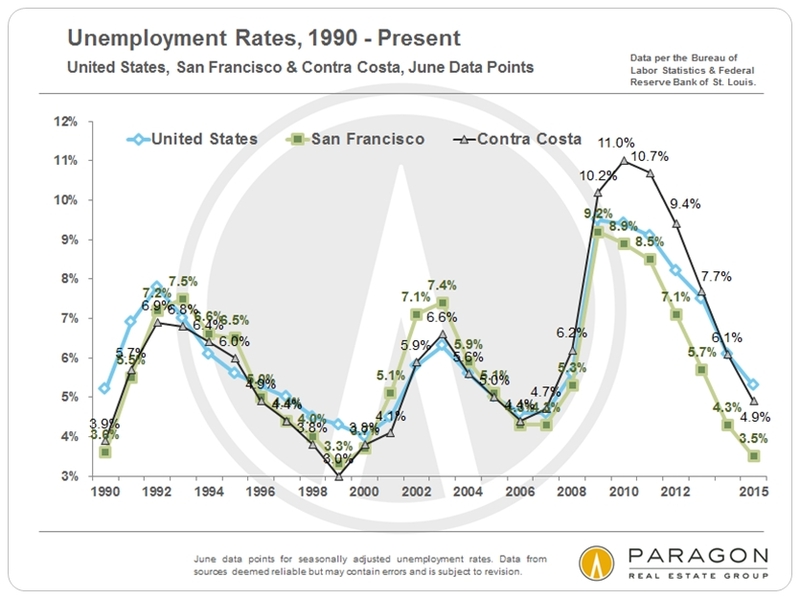 National, SF & Contra Costa unemployment trends: Very positive. 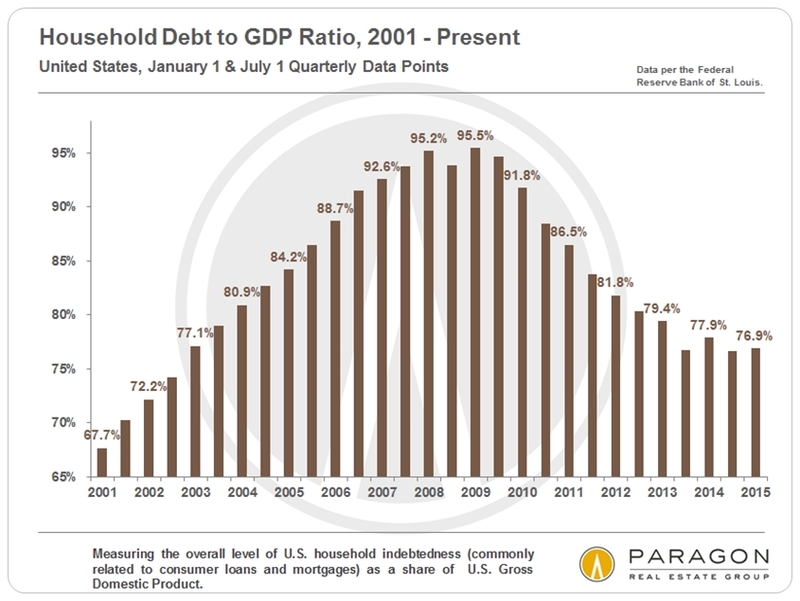 huge issues in the 2007-2008 crash – have declined significantly since then. price trends. 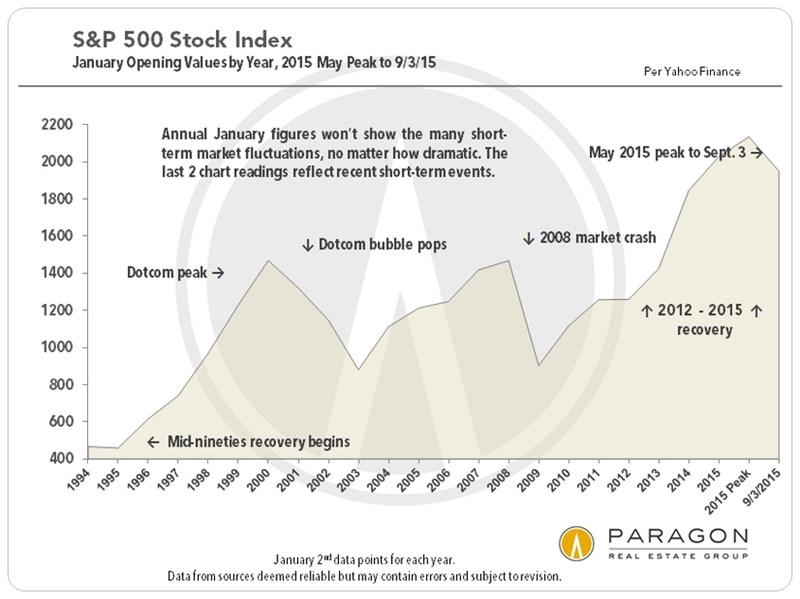 Short-term financial-market fluctuations, even if dramatic, typically have no effect. With the recent correction, the ratio has declined again. “Renting can make sense as a lifestyle choice or because of income constraints. These analyses were made in good faith with data from sources deemed reliable, but they may contain errors and are subject to revision. Statistics are generalities and all numbers should be considered approximate. Sales statistics of one month generally reflect offers negotiated 4 – 6 weeks earlier.Header photo by Falcorian, gratefully used by permission under the Creative Commons License.